This commercial quality outdoor 4’ booth bench is ideal for restaurant decks, patios, cafes, hotels, poolside and other outdoor dining and relaxation. 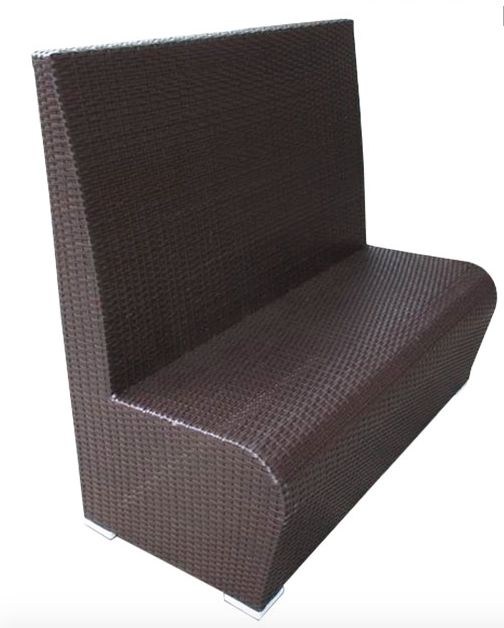 The synthetic wicker goes well with other synthetic wicker families of outdoor furniture as well as looks good with other finishes and materials like synthetic teak, aluminum, and other outdoor furniture materials. Also available with a custom upholstered seat cushion, made of Sunbrella high performance outdoor fabrics with many color options. Cost per booth with cushion is $479.99. Non-stocked colors may vary in price.